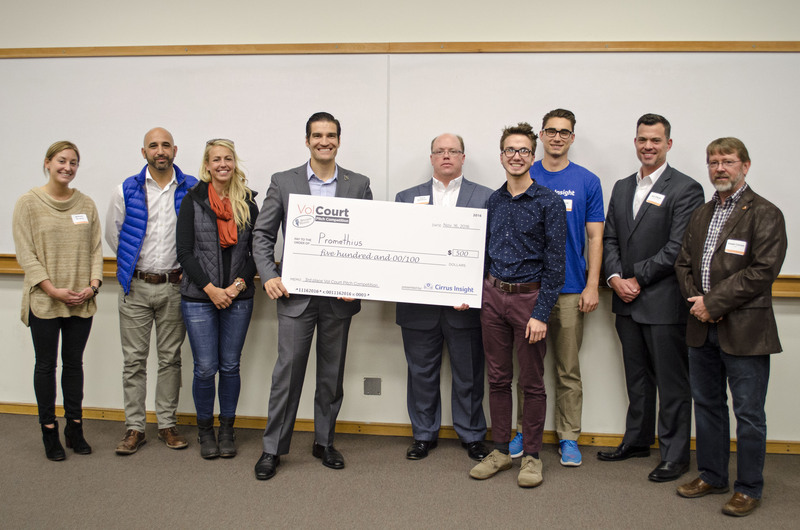 GeoAir, a startup company founded by University of Tennessee, Knoxville, MBA candidate Alex Adams, won top prize at last week’s fall 2016 Vol Court Pitch Competition. The company beat 18 competitors to take first place at the competition, which was hosted by UT’s Anderson Center for Entrepreneurship and Innovation. GeoAir gives a faster, more precise way to identify mold in fields by using a drone to take airborne samples of the field. That data is used to create a heat map, which identifies mold hot spots. This information allows growers to spot treat the areas instead of the entire crop, saving time, money and crop production. 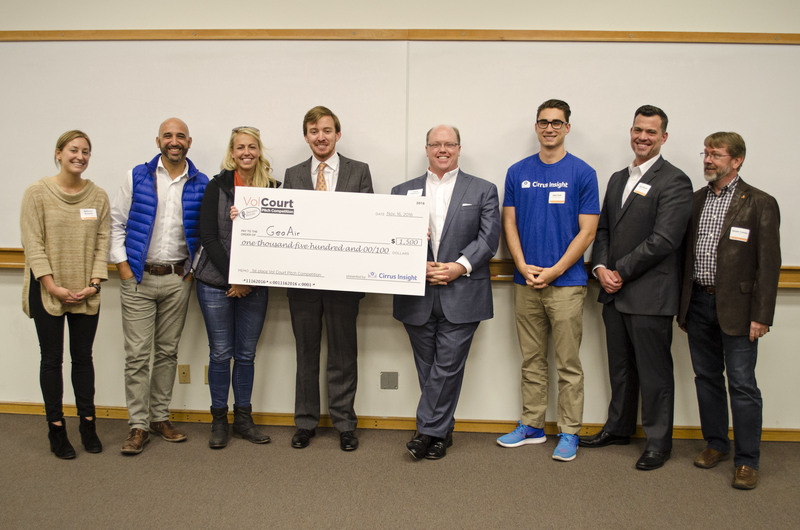 Adams won $1,500 along with one year of free office space in the UT Research Foundation Business Incubator, consulting services courtesy of PYA, legal advice from Morehous Legal Group and a yearlong subscription to TurboFunder provided by Funding Sage. Second place went to Taylor King’s ReInvent, an upcycling company that helps people take recyclable materials and transform them into works of art with the help of a local artist. King, a senior in business analytics, won $1,000, six months of free office space in the UT Research Foundation Business Incubator, consulting services from PYA, legal advice from Morehous Legal Group and a yearlong subscription to TurboFunder provided by Funding Sage. Third place went to Prometheus Group LLC, a consultancy group that focuses on risk management and travel security, reducing the cost of risk assessments for travelers while improving efficiency. The company was founded by Christopher Ruel, an MBA candidate and U.S. Army Special Forces veteran, and Jared Smith, a senior in honors computer science and project leader at Oak Ridge National Laboratory’s Cyber Warfare Research Team. The team was awarded $500 and a yearlong subscription to TurboFunder provided by Funding Sage. 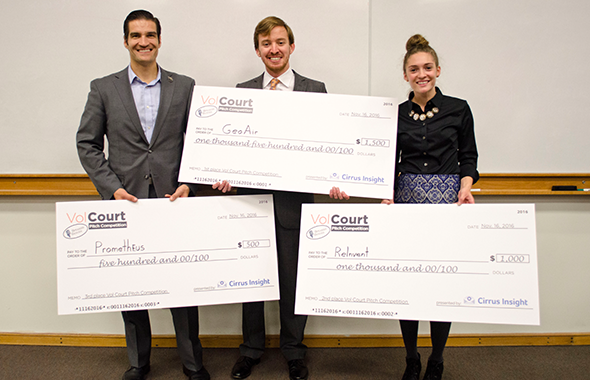 The Vol Court Pitch Competition was the final event of the fall 2016 Vol Court Speaker Series. Prior to the competition, teams attended five entrepreneurial lectures covering topics like legal structure for businesses and unconventional funding sources. Prize money was donated by presenting sponsor Cirrus Insight and supporting sponsors Launch Tennessee and the IT Company. Vol Court is a free event hosted by the Anderson Center each fall and spring semester. It is open to UT students, faculty and staff as well as members of the local community. It’s made possible through sponsorship from Cirrus Insight, the UT Research Foundation, Launch Tennessee, PYA, Morehous Legal Group, the IT Company, Hard Knox Pizzeria, Three Roots Capital and Funding Sage. Vol Court kicks off Oct. 12 with a six-week entrepreneurial speaker series. The series culminates Nov. 16 in a pitch competition where attendees put what they’ve learned into practice. Local entrepreneurs and UT faculty will cover topics including legal structure for businesses and unconventional funding sources. Now in its eighth year, Vol Court invites UT students, faculty, staff and members of the local community to pitch their business ideas. Winners receive up to $1,500 in prize money, space in the UT Research Foundation Business Incubator, and legal and accounting services. Shawn Carson, Vol Court director, will share his expertise from 15 years in entrepreneurship. Vol Court meets every Wednesday beginning Oct. 12 from 5:15 to 6:15 p.m. in Room G4 of Stokely Management Center, 916 Volunteer Blvd. The speaker series and pitch competition are open to the public. There is no charge to participate in the event, and anyone interested in starting a company is encouraged to attend. Anyone who participates in the Nov. 16 pitch competition must have attended four of the following five series meetings. The application period is now open for the Boyd Venture Challenge, a seed fund grant that awards up to $20,000 to student-owned startup companies each fall and spring semester. 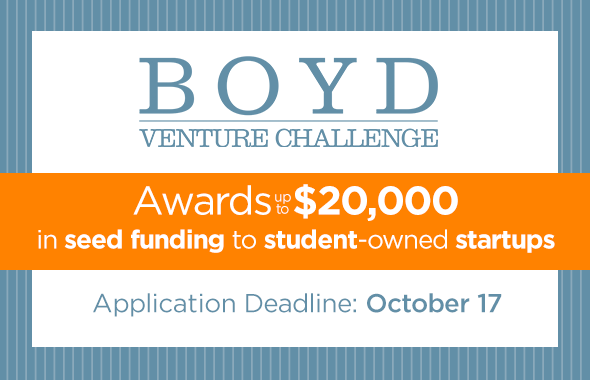 The Boyd Venture Challenge is open to any early-stage company owned by a UT student. To be eligible, companies must be legally established and the student owner(s) must be enrolled in a UT Knoxville or UT Institute of Agriculture undergraduate, masters or PhD degree program at the time of application. Applications must be received by the Anderson Center no later than midnight, Mon., Oct. 17, 2016 and should consist of an executive summary, requested funds and milestones that will be accomplished with the funds, if awarded. Teams that advance to the presentation round will pitch to a panel of local business professionals on Fri., Oct. 28. For full application instructions and eligibility details, visit https://tiny.utk.edu/Boyd-fall16. The Boyd Venture Challenge is made possible by the generosity of Randy Boyd, Founder and Executive Chairman of Radio Systems Corporation, makers of PetSafe, Invisible Fence and SportDog brands. To date, this endowed fund has awarded $242,000 to 29 student-owned startups. The University of Tennessee, Knoxville, will receive grant funding to teach technology entrepreneurship, perform research and foster innovation through the National Science Foundation’s Innovation Corps (I-Corps) program. A public-private partnership, I-Corps was created in 2011 to train researchers to evaluate the commercial potential of their scientific discoveries. The program is offered in a “startup boot camp” format. I-Corps South, which started with the Georgia Institute of Technology, is being expanded to include UT and the University of Alabama at Tuscaloosa and Birmingham. It will receive a collective $3.45 million over five years. For more information about I-Corps and the expanded I-Corps South Node, see the UT Haslam College of Business, the National Science Foundation and the I-Corps South website. The Boyd Venture Challenge is open to any early-stage company owned by a UT student. To be eligible, companies must be legally established and the student owner(s) must be enrolled in a UT undergraduate or graduate degree program in Knoxville at the time of application. Applications must be received by the Anderson Center no later than midnight, Fri., Mar. 4, 2016. Teams that advance to the presentation round will pitch to a panel of local business professionals on Fri., Mar. 25. For full application instructions and eligibility details, click here. The Boyd Venture Challenge is made possible by the generosity of Randy Boyd, Founder and Executive Chairman of Radio Systems Corporation, makers of PetSafe, Invisible Fence and SportDog brands. 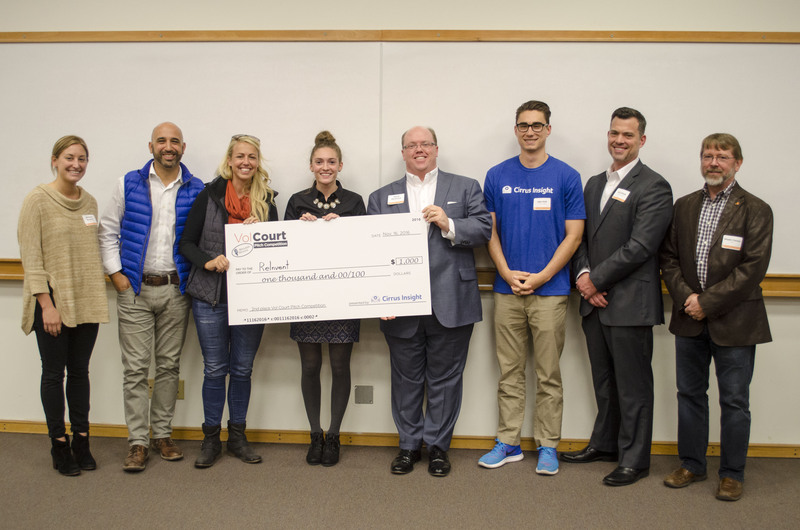 To date, this endowed fund has awarded $207,000 to 26 student-owned startups. 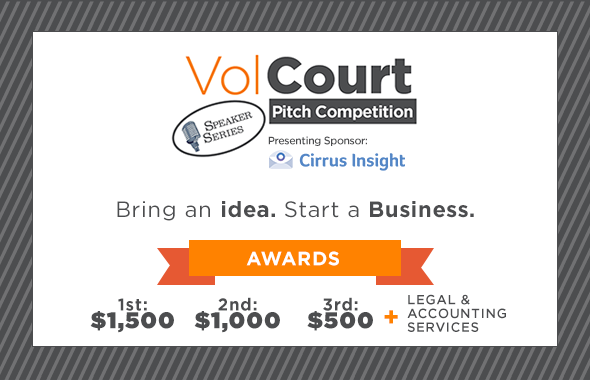 Now entering its seventh year, the Vol Court Pitch Competition encourages University of Tennessee students, faculty, staff and community members to pitch their business ideas for a chance to win $1,500, space in the UT Research Foundation Business Incubator, and free legal and accounting services. 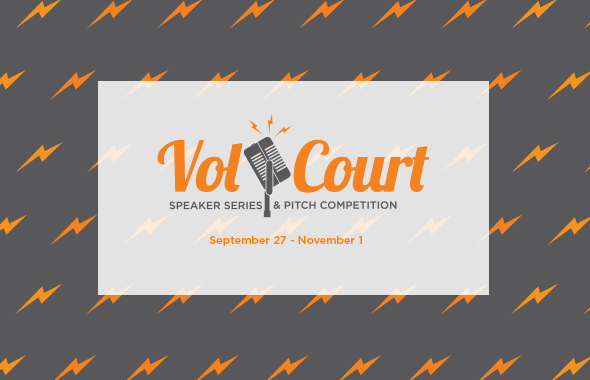 Vol Court is a six-week entrepreneurial speaker series that culminates in a pitch competition where attendees put what they’ve learned into practice. Based on suggestions from past Vol Court attendees, new topics such as “Copyrights, Trademarks and Patents” have been added to the lineup this semester. Vol Court has come a long way since it first launched in February 2010. The competition has grown from a single $1,000 award to three cash prizes. Weekly workshops that began with just 20 people now average at least 60 attendees. Vol Court meets from 5:15 to 6:15 p.m. every Wednesday beginning Feb. 17 in Room 104 of the Haslam Business Building, 1000 Volunteer Blvd. There is no charge to participate and registration is not required. Anyone who participates in the March 30 pitch competition must have attended four of the five series meetings. Vol Court is a semi-annual event hosted by the Anderson Center for Entrepreneurship and Innovation. 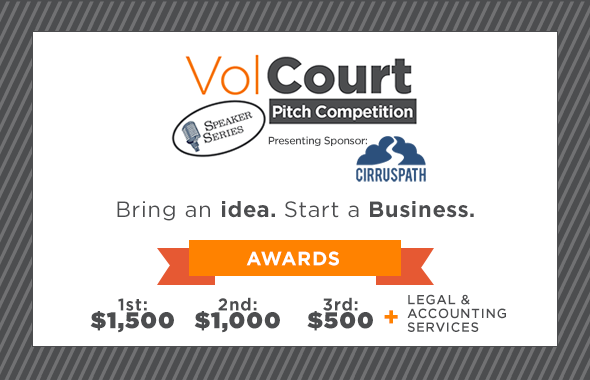 Vol Court is made possible by donated funds and services from our sponsors: Cirrus Path, Launch Tennessee, Pershing Yoakley and Associates, Morehous Legal Group, and the UT Research Foundation.